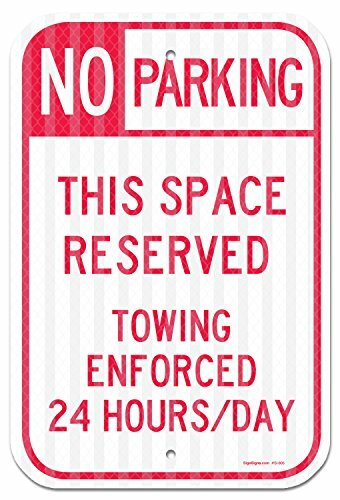 Sigo Signs No Parking - Space Reserved Towing Enforced Sign is proudly made in the USA. Every sign is manufactured in our facility with up most quality and care. They are printed with high resolution machinery. They have predrilled holes for fast and easy installation. This sign is a .63 mil thick heavy-duty aluminum. Unlike steel signs, our aluminum signs do not rust. They should last up to 7 years outside. Signs have four holes, one in each corner. Signs can be mounted with screws or nails. Each corner is rounded for longer life and easier handling. Aluminum signs have a service temperature range from 20 to 168 degrees f. Sign lasts 7 plus year's outdoor life. They have great water and chemical resistance. Typical maximum temperature 168 degree f. Mounts with screws or clips. Measures 12 inches width by 18 inches height. Beautiful color combination. If you have any questions about this product by Sigo Signs, contact us by completing and submitting the form below. If you are looking for a specif part number, please include it with your message.